Derek Sanderson was a talented and colourful player in the National Hockey League. Derek began his hockey apprenticeship as a Junior with the Niagara Falls Flyers. He lead his team to a Memorial Cup with his scoring talent and hard work ethics. Derek entered the National Hockey League with the Boston Bruins in 1965. At the end of his first season, he was named winner of the Calder Cup, which is presented annually to the N.H.L’s "Rookie of the Year". Derek continued to play with the Boston Bruins until 1972 -the year they won the Stanley Cup. 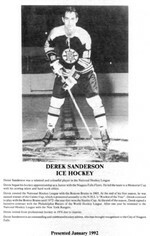 At the end of the season, Derek signed a lucrative contract with the Philadelphia Blazers of the World Hockey League. After one year he returned to the National Hockey League with the New York Rangers. Derek retired from professional hockey in 1976 due to injuries. Derek Sanderson is an outstanding and celebrated hockey athlete, who has brought much recognition to the City of Niagara Falls.